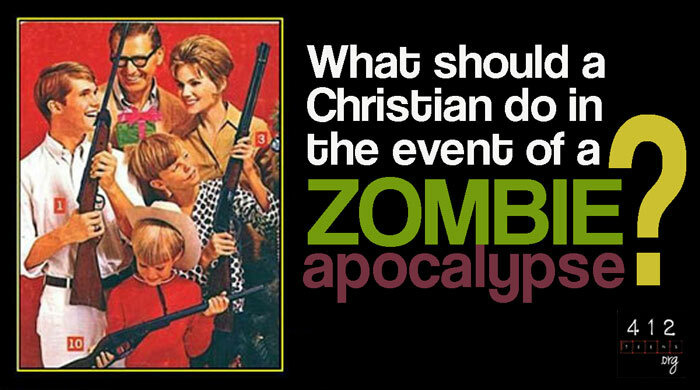 What should a Christian do in the event of a zombie apocalypse? It's the middle of the night. You're watching re-runs of The Simpsons, South Park, Masterpiece Theatre, or whatever. Suddenly, you hear a crowd of brain dead people moaning, and the odor of rotting flesh begins to permeate throughout the house. You rush to the door, knowing that there are only two explanations: (1) the local sports bar just closed up, or (2) the dead have risen from their graves to eat your flesh! What do you do? Do you try to convert these zombies to Christianity, or do you grab Uncle Barney's shotgun and fill 'em full of holes? First, let's see what the Bible has to say about the undead. Since the people are already alive, this is not quite a description of a true zombie, but more of an inverse zombie. 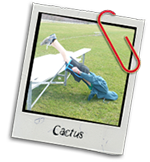 However, it does describe what zombies might look like when they attempt to overcome the human race. Matthew 27:51-53 also showcases zombie appearances in scripture; however, it doesn't really say what they look like. In fact, while the Bible (both Old and New Testaments) gives us many descriptions of zombies, none of them go into much depth about what they look like, or if they have spiritual souls for that matter. In Matthew 27:51-53, God mentions holy people coming back to life and being used by God to show people Jesus' holiness. In this case, yes, the zombies would have souls and should not be annihilated with AK-47s, axes, cacti, spoons, or whatever your choice of weapon would be. However, the type of zombies I am referring to are the ones that were not raised to proclaim the news of Jesus Christ. I am referring to the zombies that have escaped from the bonds of death and are only interested in eating the flesh of you and your loved ones. In this case, these are zombies not sent from God, but zombies sent by Satan. It is much more theologically likely that the souls of these zombies are already in the afterlife, but their bodies, by no fault of their own, were selected by Satan to be a medium for his evil will. We can be assured of this by reading Ephesians 6:12: "For our struggle is not against flesh and blood, but against the rulers, against the authorities, against the powers of this dark world and against the spiritual forces of evil in the heavenly realms." The one thing a Christian should not do during a zombie uprising is cut all emotional ties and put your own survival above anyone else's. John 15:13 tells us that there is no greater love than sacrificing your life to save a friend's or, for that matter, the life of any other living human being. Some people have the tragic notion that as soon as the first zombie takes the very first juicy bite out of someone's leg, then all morals go out the window, and we no longer have to follow any of the laws of Christ. But we are assured that, in all time, no circumstance can ever erode the sacred commandments of God, and in every situation, even a zombie apocalypse, God's word still applies. The belief to the contrary, that natural morals are not a fixed thing, which is called relativism, is a completely un-Christian belief. No matter how many zombies there are and how ready for dinner they are, we can never simply abandon our God given morals. Yes, killstreaks and headshots are important, but in defending our family and friends, we just can't forget God's love and mercy.